Once She Monster had been made, it was apparent she needed a boyfriend. 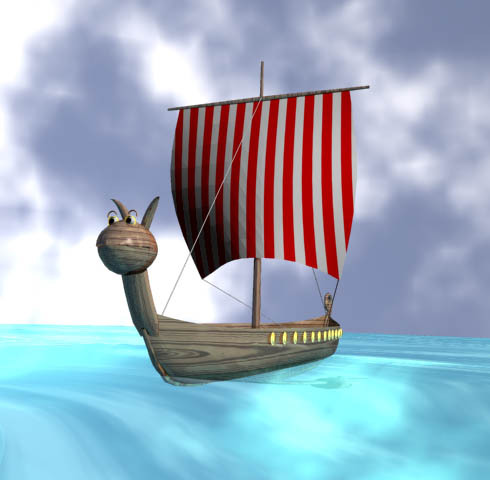 Why not a viking ship? In fact, why not an entire animation about their adventures?! They were different species, so their love would naturally be beset by difficulty. However, the power of True Love and their common interests (floating around the ocean and having watermelon-shaped heads) would conquer all. That is, assuming the viking ship was really alive and not merely made of wood. The boat's hull was modeled by draping cooked spaghetti across a plastic toy. Once the pasta dried and hardened, it was scanned and the resulting curves were used in a 3D program. Animation time! There were only two issues: no script and slow hardware. In the meantime, a producer of animation videos ran across these stills and asked to see the final product. Perhaps he could put it in one of his collections? Alas, tests revealed that rendering even a short cartoon would take months or years. Thus ended the romance of the melon-headed lovers.